African acoustic guitar music is, for me, some of the more sublime music in the world. And certainly some of the greatest examples came from what was then the Belgian Congo, right around the mid-century mark. Ngoma remains the most important Congolese record label, as well as one of the most important labels in all of Africa. It was started by two Greek brothers, Nico and Alexandros Jéronimidis, around 1948. Not only did they record well over a thousand discs, the first to capture all manner of Congolese musical styles (the rumba, cha-cha, and solo acoustic guitar picking of course), but they encouraged experimentation by their musicians. 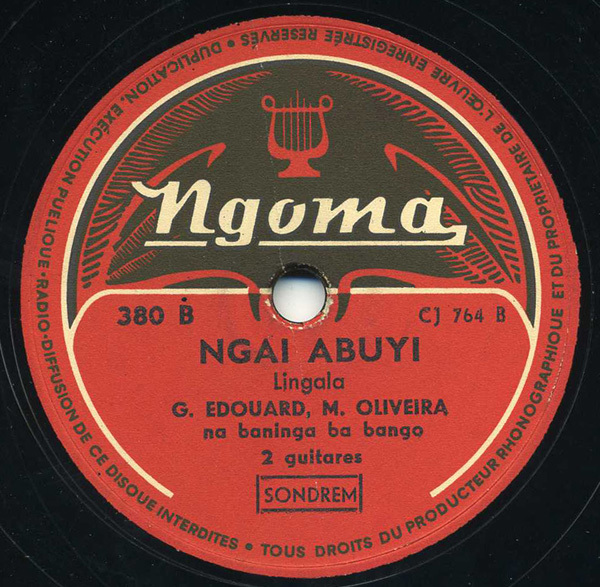 Ngoma records were pressed in France and distributed primarily in Central Africa – Congo and Cameroon especially – and as such are, well, impossible to find. Not only that, but all the Ngoma masters were long ago lost in a warehouse fire. As if that wasn’t enough, the company then donated all of its file copies to the Congolese government, only to have those destroyed during political strife. Here’s a nice guitar duet by Georges Edouard and Manuel D’Oliveira, released sometime in the late 40s-early 50s. Absolutely worth searching out are two collections of Ngoma material, released on CD in the late 90s. The first contains all 78rpm material and is titled “Ngoma: The Early Years.” The second is mostly 45rpm Ngoma records, and is titled “Ngoma: Souvenir ya l’Independence.” I’m not sure if they’re even technically in print anymore, but they’re definitely worth digging up. And the next two weeks are crazy for me – next post after the 18th. Besides the Ngoma compilations on CD, you’re undoubtedly familiar with the 2 Roots of Rhumba Rock compilations, I believe on Crammed Discs, and the Sharp Wood reissues of Hugh Tracey’s field recordings – in this context, particularly of Mwenda Jean Bosco? I love your site and will be checking back regularly! Yes indeed, I’m a big Tracey fan and have some Tracey-recorded 78s from Congo, etc. The Sharp Wood CDs are fantastic. I haven’t yet listened to the Rhumba CDs, but I’m sure I’d like them…I will definitely post more of this material in the future. PS – Thanks very much for checking out the blog!